Its major export partners are China and Thailand. Its main exports are natural gas, wood products, pulses and beans. Its major import partners are China, Thailand, and Singapore. Its major imports include fabric, petroleum products, and fertilizer. 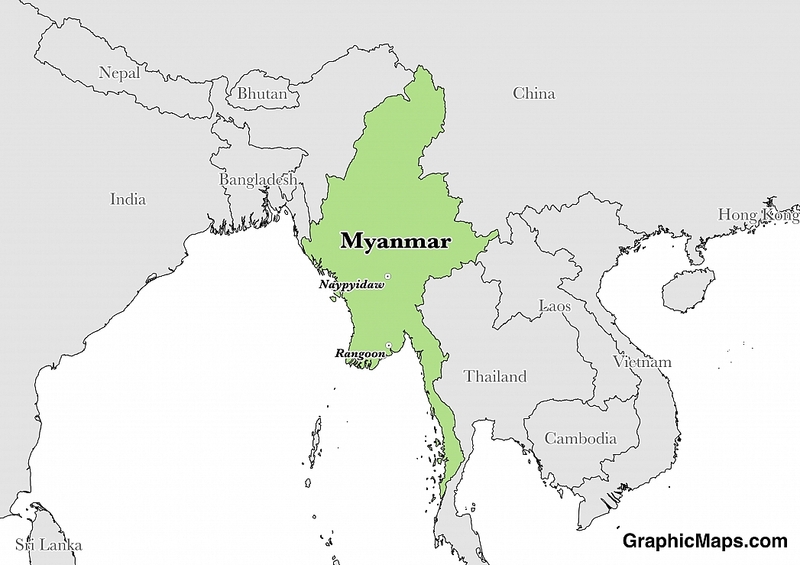 Located in Southeastern Asia, Myanmar has a 6,522.00 km border with Bangladesh (271 km), China (2,129 km), India (1,468 km), Laos (238 km) and Thailand (2,416 km). It has a 1,930.00 km coastline. Burma is the site of several illegal trafficking routes. The capital city of Myanmar is Naypyidaw which is located in the central-southern region of the country. Naypyidaw has only been the capital city since the settlement of the area in 2005 and is unique in the fact it has been a planned city since the beginning of its existence. The city covers an area of 7,054.4 square kilometres (2,723.7 square miles) and is located between the Bago Yoma and Shan Yoma mountain ranges. The population of Naypyidaw is estimated at 924,608 according to government figures. Myanmar is an Asian country covering 676,578.00 km2 of which 3.41% is water and 653,508.00 km2 is land. This makes it the 39th largest country in the world and slightly smaller than Texas. Its geographic coordinates are 22 00 N, 98 00 E and Nay Pyi Taw is the capital city. Both Burma and Myanmar are derived from the name of the majority Burmese Bamar ethnic group. Its ISO code is MM. Myanmar has a mean elevation of 702 m above sea level. It has a tropical monsoon climate with cloudy, rainy, hot and humid summers with drier winters. Its terrain is predominantly made up of lowlands with some rugged highlands. Myanmar has a population of 56,890,418 making it the 24th largest in the world. The contry's population is highly concentrated along coastal areas. Burmese is the official language. The major ethnic groups reported are Burman, Shan, and Karen. The population is mostly Buddhist with a Christian minority. The official language of Myanmar is Burmese which has seen three major incarnations since the 12th century. Old Burmese, Middle Burmese, and the Modern Standard Burmese language used today are all important in understanding the linguistic culture of Myanmar. Evolving from the Sino-Tibetan language family, Burmese is the fifth language from this family to develop a writing system. There is also a national standard for Burmese Sign Language which is taught in the three schools for the deaf in Myanmar. Myanmar is home to around 100 languages that represent five major language families; Sino-Tibetan, Austro-Asiatic, Tai–Kadai, Indo-European, and Austronesian. The dialing code for the country is 95. Myanmar is an independent country. It gained independence from the United Kingdom in 1948. Its constitution was last ratified in 2008. Myanmar is considered a unitary parliamentary republic which means that the central government is the supreme power and administrative divisions only exercise powers vested in them by the government. The country was ruled as a British colony from 1824-1948 and the post-colonial transition to democracy was difficult. In 1962, General Ne Win led a coup d'état that saw military rule reign supreme in Myanmar for almost 50 years. Although Myanmar's days of military dictatorship are over, the military holds important positions of power and influence within the government. Factoring in Purchasing Power Parity, Myanmar's GDP is $307,000,000,000.00 (USD) with $6,000.00 (USD) per capita. This makes it the 53rd largest economy and its citizens the 156th richest in the world. The currency of Myanmar is the Kyat (MMK). Its major export partners are China and Thailand. Its main exports are natural gas, wood products, pulses and beans. Its major import partners are China, Thailand, and Singapore. Its major imports include fabric, petroleum products, and fertilizer. 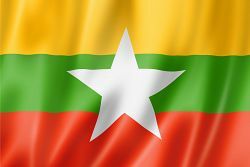 The flag of Myanmar consists of three equally sized horizontal stripes of yellow, green, and red with a white, five-pointed star in the center. The design was included in the 2008 Constitution of Myanmar although new designs for a national flag had been openly proposed in the 2006 national constitutional conventions. The flag was officially adopted on 21 October 2010 after the 2008 Constitution of Myanmar laid the foundations for the transition to a democratic republic. This national symbol replaced the Civil Ensign of Burma which has been in use since 1952. Within the flag of Myanmar, green is representative of peace, the dense forestry in Myanmar, and tranquillity. The red is a symbol of the courage and determined spirit of the people of Myanmar and the yellow is a symbol of solidarity between these citizens of the country. The white, five-pointed star represents unity among ethnic groups in Myanmar.